Hudson and I spent most of our day yesterday huddled up on the couch because it was freezing in my apartment. For some reason, the heat wasn't working, and with temperatures outside in the 20s, it was not a fun day. I did my best to warm the place up with food. Cranking up the oven to roast any roast-able vegetables I could find in the fridge. I also put a pot of soup on the stove, and made mug after mug of coffee, only getting through about a third of each one before it turned too cold to drink. When Eugene got home from work, he arrived to find Hudson layered under three blankets and shivering. He got the super to come and check things out and by that night the heat was working again (actually I'm sitting here typing this with the windows open, because it's now working a little TOO well. ::sigh::). 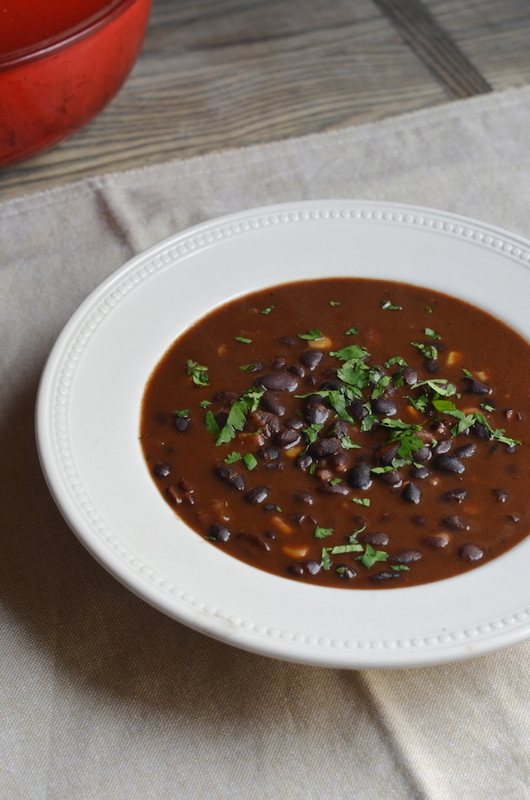 The soup that I made was this Spicy Cocoa Black Bean Soup. A simple soup made a bit more interesting with the addition of cocoa powder and ancho chile powder, for a bit of rich and complex flavor. Just the thing to warm you up on cold winter nights. Heat the oil in a large, heavy pot over medium heat. Add the diced onions, peppers, and celery and sauté 5 minutes, until soft. Add the garlic and sauté 1 minute, until fragrant. Add the cumin, coriander, ancho chile, cayenne, and cocoa powder, and stir to combine well and coat all the ingredients. Add the black beans and the broth, and bring to a boil for 3 minutes. Lower heat, partially cover (so some steam can escape), and let simmer gently for 20 minutes. Note: if you like a creamier soup, at this point you can puree about 1/3 of the soup using a stick blender or by removing a portion of it to your blender. If not, skip this step. Stir in the corn and season with kosher salt and black pepper, to taste. Let simmer uncovered for 3 minutes. Remove from heat and stir in the cilantro, reserving some to sprinkle on top.